2007's first true event film hits the screens this weekend, threatening to shake up an already hot March box office. 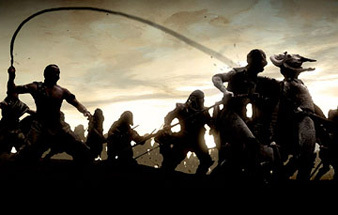 300 is the latest adaptation of comic artist Frank Miller's work, after 2005's Sin City. Where that film was an anthology of hard bitten and ultra-gory pulp crime, 300 sets its sights on historical fiction. It tells the story of the Battle of Thermopylae, where in 480 B.C. (depending on which account you believe), as few as 300 warriors from Sparta held off as many as one million Persian soldiers, successfully defending Greece, albeit at the cost of every one of their lives. In 300, we get that basic plot, but turned up to 11 and then sprinkled with testosterone sauce. Like the heavily stylized Sin City, 300's major attraction is its dramatic look and promise of kinetic and over-the-top action. Realists and purists should probably avoid this film or at least turn off their brains, as 300 takes ancient hand-to-hand combat and propels it to rather insane new heights. Like, waves of human bodies new heights. The cast contains very few names familiar to multiplex audiences, though Gerard Butler and Dominic West might jog a few memories. The director is Zack Snyder, who made his big screen debut with the outstanding Dawn of the Dead remake in 2004. Critical reception is mixed, although this is not a film with an audience that will care much about reviews. Most were likely hooked from the first trailer, which quickly pegged it as a film to pay attention to, and perhaps the "yelling-ist" movie ever. Apart from the stylistic connection to Sin City, another comparison for the potential appeal of this movie is Troy, which opened to $46 million in May of 2004. While Gerard Butler is no Brad Pitt, the overabundance of action and effects more than makes up for that. Opening at 3,100 venues, 300 should easily win the weekend, and may very well become the biggest opening film of the year to date. Look for a weekend figure of $49 million.